TTS - 3D Print Prototypes d.o.o. Pro-Bot, Bee-Bot & Blue-Bot There are	7 products. 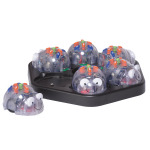 In this category, we present you a new kind of robots designed for learning creativity, critical thinking, programming basic and complex algorithms from young age. TTS has developed Robot Pro-Bot, Bee-Bot and Blue-Bot robots, well known in UK Education Curriculum (KS1 and KS2 UK Curriculum Robots). 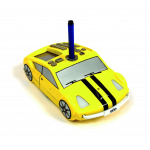 Probot, Bee-Bot and Blue-Bot can be manually programmed (simple programming) or programmed in the LOGO program (complex programing), such as Probot. 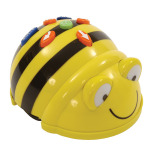 Bee-Bot and Blue-Bot with kids interact with the buttons (manual programming, eg. up, down, left, right, pause, go) and visual mastering like the various maps that the programmed robots are moving. The aim is to get the child into the programming with the buttons, and to perform the simple and complex tasks to do "debugging" problems on the map. After some time of use, children begin to perceive the algorithms around themselves and move toward to more advanced learning and creation. Pro-Bot has the option of adding flomaster or pen and programmed drawing via manual coordinate input or via the LOGO program coordinates. Solid and resistant bodywork for everyday use in school. 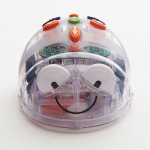 Pro-Bot incorporates a LED headlamp light sensor, voice sensor and bumper sensor. Pro-Bot is used for Windows 7 and above. Allows you to connect to the K'Nex® platform. Explore advanced control techniques and use the screen to program on the device!